*Five breathing exercises to give your voice strength and clarity. *How to utilize muscles that you didn't know were even there to strengthen and control your voice! *6 Exercises that will effortlessly increase your range and flexibility. *Four charts for popular tunes to practice and apply the concepts you've learned. Charts include chords, melody and lyrics. *Four detailed diagrams illustrating the entire vocal tract so you can finally understand what's going on in your body when you are singing! *CD also includes a 25-minute vocal warm-up consisting of exercises on 6 separate tracks. Pop it in the car on the way to your rehearsal or download it onto your ipod and sing along. 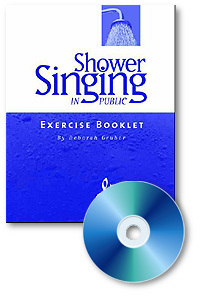 This booklet and CD have been used as the text for the popular Shower Singing in Public class offered throughout New England for the past 16 years!